The official Japanese Cardfight!! 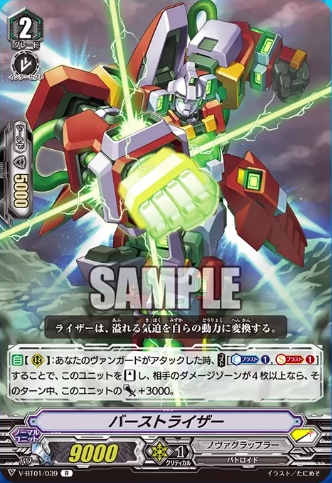 Vanguard YouTube channel revealed a new card as part of its weekly roundup, a Nova Grappler Single Rare from V-Booster Set 01: UNITE! TEAM Q4. As Bushiroad points out in the episode, Burstraizer is perfect to use in conjunction with Perfect Raizer to stand 3 units, and with Raizer Custom as the ideal booster to make a self-standing column. On an Accel circle the card will become 22k on its second swing, making a magic number versus 12k bases like Imperial Daughter. While up to now the Raizer deck was shaping up to use some combination of Hi-powered Raizer Custom, Boomerang Thrower, and Iron Killer, Burstraizer is likely to take Killer's spot. The extra 5k shield Killer takes away on-attack is outweighed Burstraizer doing an entire second attack. 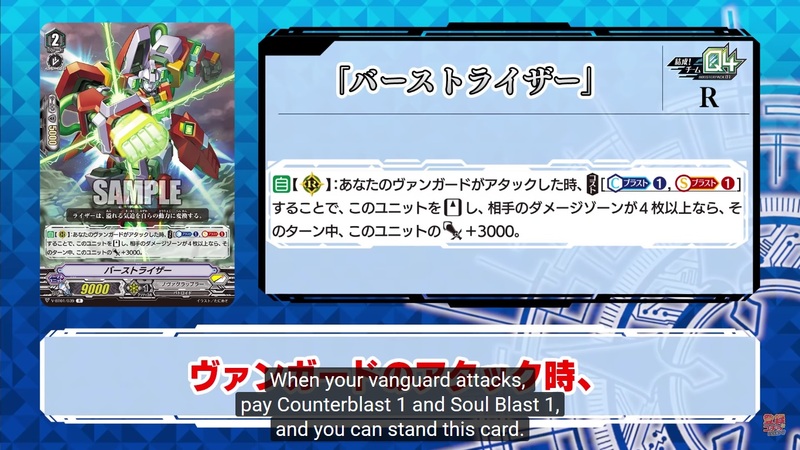 However, with how counterblast- and soulblast-intensive the Raizer deck is proving between Perfect, Burst, and Transraizer, Boomerang Thrower isn't likely to leave unless Nova Grappler's final Single Rare or Commons contain a more compelling means of doing both countercharging and soulcharging. Last week's YouTube exclusive was the Goddess of Insight, Sotoorihime.